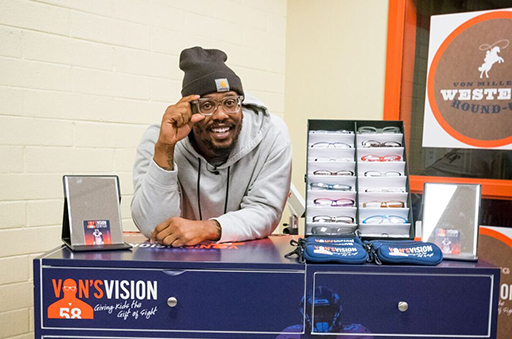 WASHINGTON, D.C. – Von Miller has been named Week 12 NFLPA Community MVP after unveiling his first “Von’s Vision Center” at the Denver Broncos Boys & Girls Club. The kiosk-like center provides underprivileged students with free eye exams, vision screenings and new glasses without having to worry about transportation. This marks the second straight season that Miller has earned NFLPA Community MVP honors for his work to provide low-income, Denver-area kids with the eyecare necessary to excel in the classroom. The new vision center is an extension of Miller’s signature outreach program, Von’s Vision Day, which provides similar free eyecare services for kids at various sites around the Denver area. Following the ribbon-cutting ceremony on Nov. 14, Miller held a Q&A with the students and foundation supporters in attendance. He used the session to share his own story of not being able to afford regular eyecare while struggling with nearsightedness as a child. Since launching his foundation, Von’s Vision, in 2012, Miller has helped improve the sight of more than 6,500 low-income youth in Denver and his home state of Texas. In March, he hosted a three-day Vision Day at Texas A&M University, where he attended college. Over that span, 270 undergraduate students received no-cost eye exams and fashionable corrective eyewear. Earlier this month, Miller raised more than $400,000 (including his own personal donation of $50,000) at his annual “Von Miller’s Western Round-Up” gala, which will go toward continuing the mission of his foundation. In honor of Miller being named this week’s Community MVP, the NFLPA will make a $10,000 contribution to his foundation or charity of choice along with an in-kind donation to him on behalf of our supporting partner Delta Private Jets. A limited-edition bobblehead will also be made of Newton and sold by our supporting partner Forever Collectibles at www.foco.com. The NFLPA will donate part of the proceeds from this collector’s item to their charity or foundation of choice. Miller, along with the other 2018 Community MVPs, will become eligible for this year’s Alan Page Community Award, which is the highest honor that the NFLPA can bestow upon a player.